The Cardinals and Dodgers met in the NLCS last season, with the Cardinals winning the series 4-2. Most of the same players are back for both team with just a few key additions. Last season the Cardinals had the better record, and had home field advantage. This season the Dodgers have the better record and will get the home field advantage, which could be a key in this series. Clayton Kershaw (21-3) had to pitch in St. Louis in both of his starts in that series, he lost both of them. The Cardinals have suffered a lot of key injures this season and that will have a big impact on this series. Last season when they met it was a seven game series, and this season it’s a five game series. That will give the Dodgers the advantage. This series will feature some of the best pitching match-ups that we will see this postseason. Each team top two starter finished the season in the top 10 in NL ERA. The Cardinals have Adam Wainwright pitching Game 1 for them. Wainwright finished the season with 2.38 ERA and a record of 20-9, and he somehow finished third in ERA and tied for second in wins. Wainwright has been a great postseason pitcher with a 2.53 ERA and a 4-3 record. Pitching Game 2 for the Cardinals is Lance Lynn who finished ninth in the NL with a 2.74 ERA. Lynn went 15-10 this season, he has a 4.54 ERA in 39.1 innings in his postseason career. The Game 3 starter will be John Lackey, he had a 3.82 ERA this season to go with his 14-10 record. The Cardinals acquired him from the Red Sox before the All Star break, Lackey is a very good postseason pitcher posting a 3.03 ERA and a 6-5 record in 16 career starts. St. Louis has already announced their Game 4 starter, and it’s Shelby Miller. Miller, who is just 23, had a great season and looks like a future All-Star. Miller went 10-9 this season with a 3.74 ERA. The experience of the first three starters will be a key in this series. Los Angeles will be pitching no other than Clayton Kershaw in Game 1. 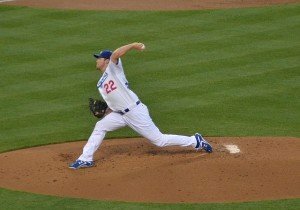 Kershaw will more than likely win the Cy Young and the NL MVP this season. He went 21-3 with a 1.77 ERA and struck out an incredible 239 batters. Kershaw was able to hold opposing batters to a batting average of just .196, he also had a WHIP of 0.86. He had by far one of the greatest seasons we have ever seen out of a pitcher, but Kershaw has not been the greatest postseason pitcher and he definitely struggles with the Cardinals. Kershaw gave up seven runs in four innings against the Cards in the pennant clinching Game 6 last season. He has a career ERA of 4.23 and a record of 1-3 in the postseason. All-Star Zack Greinke will pitch in Game 2 for the Dodgers, he was 17-8 this season with a 2.71 ERA. He has not been a great postseason pitcher either. Greinke is 2-2 with a 4.30 ERA in six postseason starts. Most of Greinke postseason struggles happened when he was with the Brewers, he did a good job against St. Louis in the NLCS last year. Hyun-jin Ryu will pitch Game 3 for the Los Angeles, he’s in second season in the majors. Ryu went 14-7 this season with a 3.38 ERA. Ryu pitched seven innings against the Cards last year and gave up just three hits and no runs. The Cardinals struggled to score runs this season, which isn’t like them. The finished the season 23rd in the majors with 619, a year after finishing third with 783. St. Louis hit .254 this season which runners in scoring position and last year they hit an unbelievable .330. The Cardinals also finished last in the NL in home runs with a 105, the only team to hit less was the Kansas City Royals with 95. St. Louis isn’t really known for their power, as the did hit 27th in the majors last season with 125, but their offensive struggles could cost them this series. Matt Adams led the team with a .288 batting average, with Johnny Peralta leading the team in home runs with 21. Matt Holliday came in right behind him with 20 home runs, he also led the team with 92 RBIs. The Cardinals have the potential to be a very dangerous offensive team and they are a playoff team, so don’t be surprised if you see someone get hot like they have in the past. Los Angeles led the NL in scoring after the All-Star break and hit .295 as a team in September. They averaged 6.24 runs per game during that time. Carl Crawford struggled with an injury earlier this season, but came back to hit .300. Crawford best month was September though as he hit .448. Matt Kemp has also looked like his former self since the break hitting 17 home runs and 54 RBIs, Kemp finished the season with 25 home runs and 89 RBIs. Adrain Gonzalez hit 27 home runs and led the majors with 116 RBIs. The Dodgers also have a weapon in Dee Gordon who led the majors in stolen bases with 64, to go with his .289 batting average. On paper the Dodgers have the best offense in baseball, but can they come thru in the postseason? St. Louis will have to most effective reliever in the series with Pat Neshek, who had a 1.87 ERA in the regular season. He only allowed three runs before the All-Star break, he has allowed 11 since. The Cards will also feature the hard throwing closer Trevor Rosenthal, he finished second in the NL to only Craig Kimbrel with 45 saves. St. Louis also will feature the sinker specialist in Seth Maness, who pitched 80.1 innings this season, and had an ERA of 2.91. The Cardinals relievers had a team ERA of 3.62. The Dodgers had a team ERA of 3.80, which is the worst of all the playoff teams. The bullpen is the biggest concern for Los Angeles. The one bright side for the Dodgers has been Kenley Jansen, who had 44 saves and an ERA of 2.76. Jansen tied Francisco Rodriguez for third in the NL in saves. Brian Wilson has struggled this season, after pitching great last season. Wilson finished the season with a 4.66 ERA. J.P. Howell was very effective this season with a 2.39 ERA in 49 innings pitched. The Cardinals have a very deep bench with rookie outfielders Oscar Taveras and Randal Grichuk, to go with the additions of Peter Bourjos and A.J. Pierzynski give the Cardinals one of the deepest benches in all of baseball. Know of those players have been real impressive this season with Grichuk having the highest average out of the four at .245. Justin Turner has been a huge get for the Dodgers, he hit .340 this season in 288 at bats. Turner also has the ability to play all four infield positions. Turner will play a major role in this series, and could be the difference in a game. Scott Van Slyke surprised every body this season with his .297 batting average and 11 home runs. The Dodgers have the best outfield in baseball and Slyke has added insult to injury this season, by becoming another threat. Andre Ethier will also be on the bench for the Dodgers, Ethier struggled this season hitting .249. Mike Matheny is in his third season as the manager for the Cardinals. St. Louis has won the division the last two season under his command. They have been to the playoffs all three seasons, and he won the Pennant in 2013. They lost the NLCS to the Giants in 2012. Don Mattingly is in his fourth season as the Dodgers manager, and they are coming off their second straight division title. Los Angeles lost to the Cardinals last season in the NLCS. I think that the Cardinals experience, and that the team just plays different in the postseason will win them the series.